Five University of Oregon students film an investigation into “The Dyatlov Pass Incident,” where nine Russian hikers met mysterious deaths in the Ural Mountains. Holly King is a psychology student at the University of Oregon. Assigned a class project on The Dyatlov Pass Incident by Professor Martha Kittles, Holly and her friend Jenson Day receive a grant to make a student film documentary about the mystery. Denise Evers is their audio engineer. Andy Thatcher and JP Hauser are two experienced climbers tasked to help the team navigate the Kholat Syakhl in the Ural Mountains of Russia. A news report reveals that the five students subsequently disappeared in the mountains. Recovered video tells their story when hacker group Conspira-Leaks gains access to the footage. The students travel by train to Ivdel, where they plan to interview Piotr Karov, the lone survivor of the original incident. Piotr was forced to leave Dyatlov’s hiking group when he fell ill. He has been in a psychiatric hospital since his mental breakdown following the incident. Doctors at the hospital forbid the students from filming and tell them that Piotr is dead. Holly sees an old man hold up a sign from a hospital window before orderlies pull him away. The hike into the mountains begins. On their first night making camp, Holly hears strange noises. In the morning, Yeti-like footprints are found around the tents. Holly is presumed to be playing a prank. Later, Holly investigates a weather station and finds a severed tongue inside. Eventually, the hikers discover the site of Dyatlov’s camp. Andy realizes that his GPS is scrambled. JP’s compass no longer functions properly. Andy also notes that it is impossible for them to have reached the location so early in their trip. Reluctantly, the group decides to make camp for the night. At night, Holly and Jenson discover a hatch-like door in the snow nearby. They realize it opens and locks from the outside but it is frozen shut. They agree to not tell the others about the discovery and risk undue panic. They decide to investigate again in daylight. Andy spends the night sleeping with Denise. Holly sleeps with JP. The campers are awoken in the dark by the sound of explosions. They see what looks like charges detonating in the distance and an avalanche then destroys their campsite. Denise is lost under the snow and Andy breaks his leg. In the morning, two hikers are seen approaching from the distance. Andy pleads with the others to run because the hikers do not have packs and cannot be trusted. The other three students abandon Andy and retreat to the hatch while the hikers fire rifles at them. One of the bullets hits JP. Once inside the mountain tunnel, the hikers lock the students inside. Holly and Jenson explore a secret lab while JP lays wounded. They discover records from The Philadelphia Experiment regarding teleportation. A dead military soldier is found next. Holly theorizes that the man was sent to verify that whatever was in the tunnel was still there before killing the students. Holly also sees that he is missing his tongue. Incinerated humanoid skeletons are found with pointed fangs. Holly and Jenson find a duplicate of their handheld camera and realize that the teleporter must actually exist. Screams are suddenly heard. Holly and Jenson rush back to JP and find strange creatures devouring him. One of the monsters grabs Jenson but Holly uses a chain to fight them off. Holly and Jenson flee from the creatures, which appear to have the ability to teleport. The two remaining students seal themselves in another tunnel where they discover a strange portal. Theorizing that the portal can take them anywhere and that it is their only means of escape, Holly and Jenson concentrate on a spot outside the hatch and step into it. In the snow outside the hatch, Russian soldiers frighten off a pair of hikers at gunpoint. The soldiers drag the bodies of Holly and Jenson back into the facility. They are then chained in a cage from their necks. Holly and Jenson appear to have become the same sort of creatures that they were fighting. 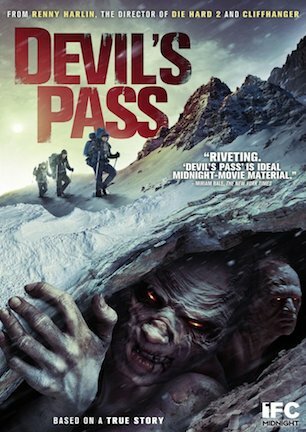 NOTE: "The Dyatlov Pass Incident" was retitled "Devil's Pass" for North America. “Found footage” as a sub-genre has to be the easiest target for horror film criticism. The format is restrictive to such a point that it is little surprise why so many of the films are similar not just in the stories that they choose, but also in the mistakes that they make. The complaints are as routinely common as the plot of having paranormal investigators wander a haunted asylum. “The handheld camera shakes too violently. Why are they constantly filming everything? Haven’t I already seen a million night vision shots of a gape mouthed phantom before?” And so on and so forth. In thinking about these sigh-inducing observations that some make about “found footage” while watching director Renny Harlin’s entry into the sub-genre, there was a realization that “The Dyatlov Pass Incident” may well fit under the timeless adage, “you’re damned if you do, and you’re damned if you don’t.” With so many other films having worn Grand Canyon-sized grooves in the formula, Harlin and his filmmakers seemingly noted the common missteps of “found footage,” and actively worked on countermeasures. As it so happened, the alternative routes they chose came with an entirely different set of issues. The camerawork abandons overly unbalanced shakes and darkly grainy film for a clean look and smoother style that is unbelievably crisp for one camera being a handheld and another being a phone. Each time the camera is set down in the snow, it also serendipitously captures the onscreen action in a shot that is still perfectly framed. Harlin has solved the problem of making it too hard to see what is happening all of the time, but the professional quality betrays the “found footage” conceit. Ditto for the dialogue. Many “found footage” horrors throw their actors into a half-baked idea and cross their fingers that the improvisation will seem like a thought out plot. “The Dyatlov Pass Incident” gives its actors a bona fide script, and then suffers from scenes that feel too rehearsed and prepared. “The Dyatlov Pass Incident” is rooted in a true story. In 1959, Igor Dyatlov rounded up nine friends and set off to hike the treacherous snows of Kholat Syakhl in the Ural Mountains of Russia. The hikers may have been tempting a terrible fate, as Kholat Syakhl translates to, “Mountain of the Dead.” Yuri Yudin was the only survivor, having left the group mid-trek due to illness. The other nine hikers went on to die mysteriously on the night of February 2, 1959. Hikers dying in freezing temperatures or on rugged terrain is not unusual in itself, but these particular deaths were inexplicably strange. Investigators located the group’s campsite and found that their tent had been torn open from the inside. The hikers left their belongings behind and fled without shoes. Bodies were gradually discovered over a period of two months. Two were found wearing only underwear. Other corpses had fractured skulls and broken ribs, yet no signs of external wounds or a struggle. Group member Ludmila Dubinina was missing her tongue. And some articles of clothing showed high traces of radiation. Actual photo of Igor Dyatlov, Yuri Yudin, and Ludmila Dubinina. Since the four injured bodies were found in a nearby 13-foot ravine, a sensible assumption is that an avalanche caused the hikers to flee suddenly. Those who fell in the ravine then broke their bones and even bit off a tongue. But conspiracy theorists have more imaginative explanations. “Orange spheres” in the night sky reported by other hikers suggest extraterrestrials. The radiation points to military experiments and a government coverup. Fuel went on this fire when documents from the official inquest later went missing. Some even refuse to rule out a possible attack by the indigenous Mansi tribe. With so many sinister possibilities, the story is rife with seeds for sowing horror. And like the conspiracy theorists, “The Dyatlov Pass Incident” movie cannot come to a consensus about which idea works best for its plot. So it throws them all in a pot and sets the script to boil. The story nicely ties in a pair of connections to real world personalities involved in the actual case. Author Yuri Yarovoi, who was first to write a fictionalized account of what happened at Dyatlov Pass, is suggested to have been assassinated in a suspicious auto accident. Actual lone survivor Yuri Yudin also figures into the story. Although Yudin died in 2012, he is renamed Piotr Karov in the film, presumably because he is depicted as an institutionalized madman, which Yudin was not. For all the trouble “The Dyatlov Pass Incident” goes through to tie in true facts, it allows some of these threads to undo the supposed authenticity. For starters, why would the government keep Karov/Yudin alive if they were afraid of him revealing the truth about Dyatlov Pass? And why would the students be given permits to explore the area in the first place if the government wanted to keep what was hidden there a secret? The film might have applied for clemency for at least trying to avoid the most typical “found footage” obstacles, except that it commits the cardinal sin of the sub-genre. So many “found footage” movie reviews draw “Blair Witch” comparisons that it is now just as derivative to use that film as a reference point in criticism. But it begs to be mentioned here because “The Dyatlov Pass Incident” is pulled from an identical formula nearly point by point. * Doc about mysterious woods. * Campsite found disturbed in the morning. * Campers flee their tents in the night. * Heather finds a tongue. * Heather apologizes on camera. * Doc about mysterious mountains. * Holly finds a tongue. * Holly apologizes on camera. July 3, 2013 by Ian Sedensky.